This refreshing side salad from the Kitchen Vignettes blog is quick and easy to prepare, and add color to your plate. Wash the radishes and remove the stems and any long roots. Finely cube the radishes into tiny pieces. Wash the parsley and gently shake it or pat it dry. Finely mince the parsley. 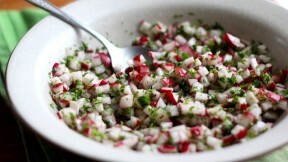 Place the cubed radishes and minced parsley in a small salad bowl. Add the lemon juice, salt and pepper. Toss gently. Add the olive oil and toss again. Taste the salad and make adjustments to your liking. (I sometimes add a little bit more lemon juice and salt).